“Extreme Pool Makeover at Villa Gardens! 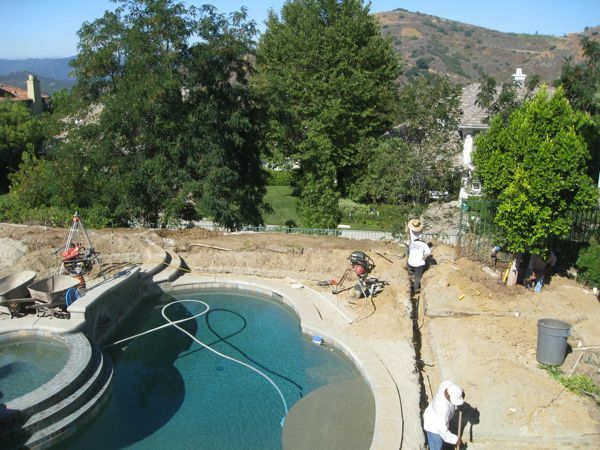 One of the most significant projects my design partners at Southern California Landscape and I proposed for our clients, the Grinbaum family of Calabasas, California was the complete renovation of their pool and deck areas. I can't believe how far we've come in just a few short weeks- it is truly an extreme pool makeover! Before- My clients did not like the formal style of the pool so we came up with a design plan to modify the shape and look of it. The pool looked fine but it was not the free flowing natural style that my clients favored. The real problem with the pool area was small deck. The deck felt cramped and seemed to be squeezed between the house and the hillside retaining wall behind the pool. In order to expand the deck, we were going to have to move a mountain for the Grinbaums and with the help of some heavy machinery, we did! 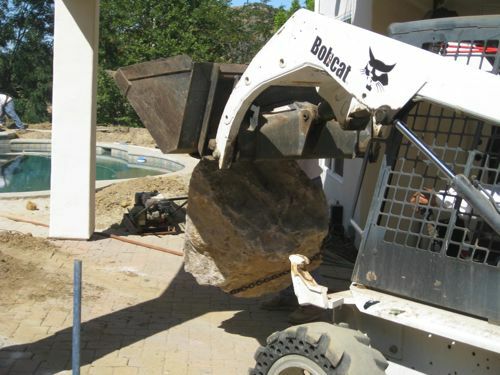 "My other car is a bobcat!" Design Tip: In a natural landscape design, consider using boulders or stacked natural stone over block walls for retaining walls when possible. There are many different varieties of stone available, so look for local stone for best price and to keep the look of your landscape consistent with the surrounding area. 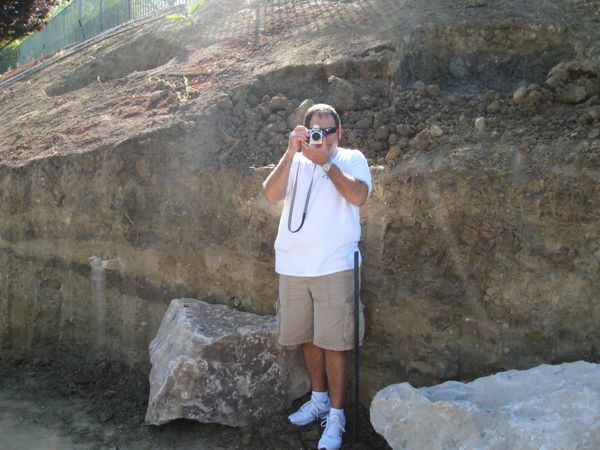 Homeowner, Joe Grinbaum gives me a taste of my own medicine as he photographs me photographing him in front of the newly cut hillside. We pushed the hillside wall back and gained about ten feet of deck space! Watch this short video for more great before and after photos of this extreme pool makeover! We replaced the pavers with three-inch-thick, over sized flagstones that were set in mortar and fashioned steps from them. The flagstone deck will feature crevice plantings to encourage storm water to percolate through the soil instead of running off into the street. A drain will collect excess water. We played it safe and dragged out the patio furniture that will be used on the deck to ensure generous traffic ways and room for the furniture. No more congested areas for the Grinbaums! Design Tip: Set pavers, flagstone and brick in sand instead of a cement slab to discourage water runoff. The above elements must be thick enough to withstand foot traffic and pressure from weather changes so that they do not crack. The new flagstone deck is large enough to accommodate lounge chairs, a dining table and some beautiful pots! Design Tip: Opt for low-growing ground covers to fill crevices between flagstones. 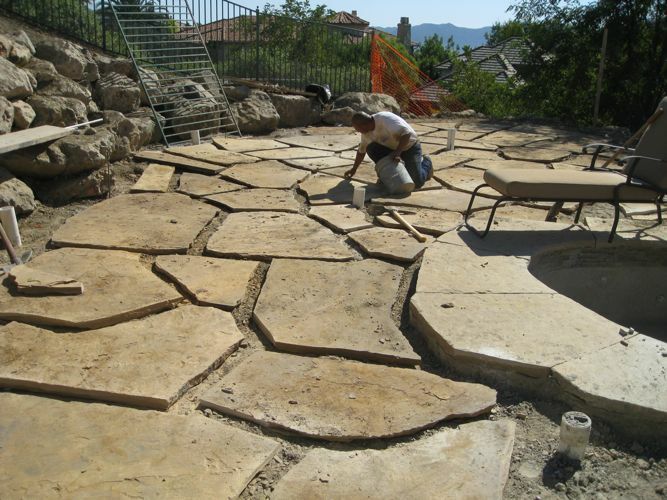 Grass generally does not do well planted in small strips and dries out easily from the radiant heat of the flagstone. Elfin thyme, sedums and other low water plants are preferable. After- The Grinbaums now have a beautiful, "almost new" natural-style pool of their dreams! I can't wait to plant, but I have to wait for the rest of the construction to be completed. After- It was worth pushing back the hill to make room for a sunny lounge area! 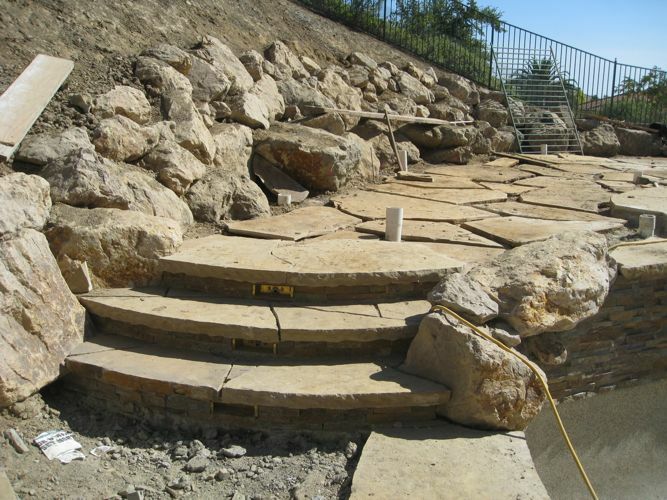 After- The pool and new deck area were treated to rustic natural stone, "Sweetwater." Over-sized flagstones were carefully selected for the steps. Notice the natural radius and "jagged" face of the stone! After- We fashioned a more natural style pool to the delight of the homeowners! After- Soft, billowy ornamental grasses and well-behaved trees ( no aggressive roots) were planted along the perimeter of the pool to soften the edges and compliment the natural style. Elfin thyme was planted between the flagstone crevices. Low water, low maintenance plants were used throughout the yard. If your pool is not your style, consider a cosmetic makeover for it. All you need is a good plan and some talented craftsmen…I know the best crew! If you missed the previous update in the Villa Garden series, "Creating a Sunset Patio Garden," go here. Very NICE!!! 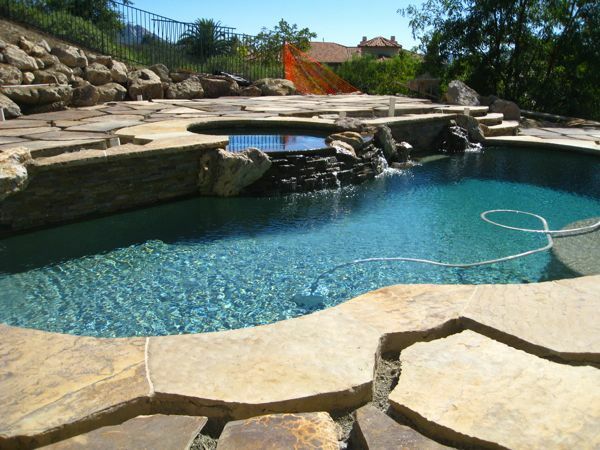 Since I’ve been servicing Calabasas with carpet cleaning for over 15 years, I’ve gotten the chance to visit lots of amazing looking homes with extremely eccentric pools! These people like nice things and they definitely know how to keep them clean. The pink grass is Muhlengergia cappilaris or “pink muhly.” One of my favorites. What gardening zone are you in? Do you know what type of ornamental grasses (pink blooms) that you used? Thanks for the compliment. I took a look at your website and I must compliment you back. Gorgeous work! I really love it! Good job Shirley. This project will definitely make your loved ones make proud of you. Hi Mother Naure and Phillip- I appreciate your visit and comments! Great project Shirley, wonderful pool.